ZF to invest $215 million to build 8- and 9-speed transmissions in S.C.
ZF's South Carolina transmission plant is forecast to annually produce 1.2 million units -- 400,000 8-speeds and 800,000 9-speeds -- once the expansion is completed in 2016. GRAY COURT, S.C. -- German supplier ZF Friedrichshafen AG said today it will expand a plant here that just started producing fuel-saving 8- and 9-speed automatic transmissions last month. ZF plans to spend $215 million on the factory expansion, boosting output 50 percent from 800,000 units annually and raising its total investment in the site to $600 million. It is the single, largest outlay ZF has ever made, company officials said today. "We will be increasing the existing footprint by almost half," said ZF CEO Stefan Sommer. "By 2016, a total of around 1.4 million square feet will be available so customers can be adequately served; consequently, the number of employees is expected to increase from 1,200 to 1,650." Automakers, under consumer and regulatory pressure to boost fuel economy, are turning to transmissions with more than six speeds to help do the job. For its 8-speed automatic, ZF already has signed up Audi, BMW, Jeep, Jaguar and Land Rover. The 9-speed automatic transmission -- the world's first -- will be used in the new Jeep Cherokee and Land Rover Evoque. The 9-speed transmission can improve fuel economy by as much as 16 percent, ZF claims. The South Carolina plant is expected to produce 1.2 million units annually once the expansion is completed in 2016 -- 400,000 8-speeds and 800,000 9-speeds. 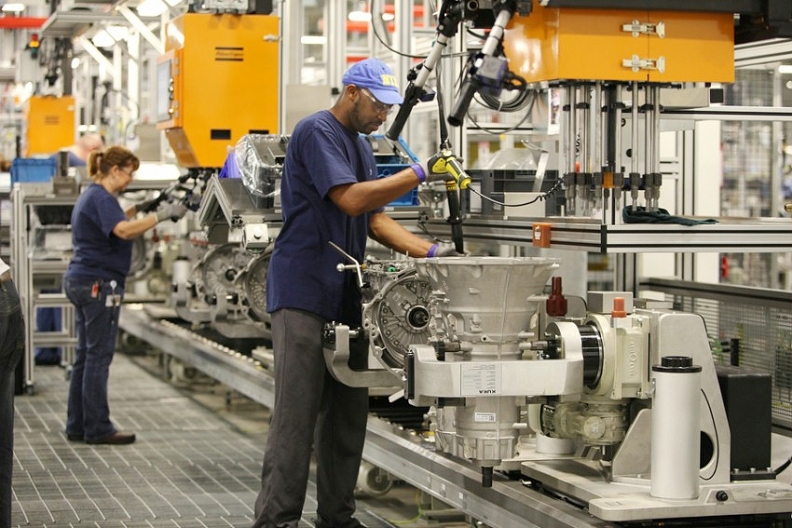 ZF said today it also is boosting capacity at a German plant that makes the 8-speed automatic. ZF's U.S. sales have tripled since 2008 to $2.3 billion in 2012, a company official said today. The 9-speed automatic is for vehicles with transverse mounted engines, while the 8-speed is used in rear-wheel-drive vehicles, such as Chrysler Group's Ram pickup. Ford Motor Co. and General Motors unveiled plans earlier this year to develop 9- and 10-speed automatic transmissions, but the gearboxes are not expected to be introduced before 2015. GM is using an 8-speed automatic made by Japanese supplier Aisin AW Co. in the 2014 Cadillac CTS sport sedan. Ford does not offer transmissions with more than six speeds.